Are you an experienced, independent Resume Writer? Join over a dozen of the top Resume Writers, already on-board! We supply Jobseekers in need of a resume & You write the resume. You can charge whatever you like – $329 or $573 or $1,263 (any amount) – your fees are totally up to you to set. We can setup multiple distinct products as well. The Buyer chooses their budget range. 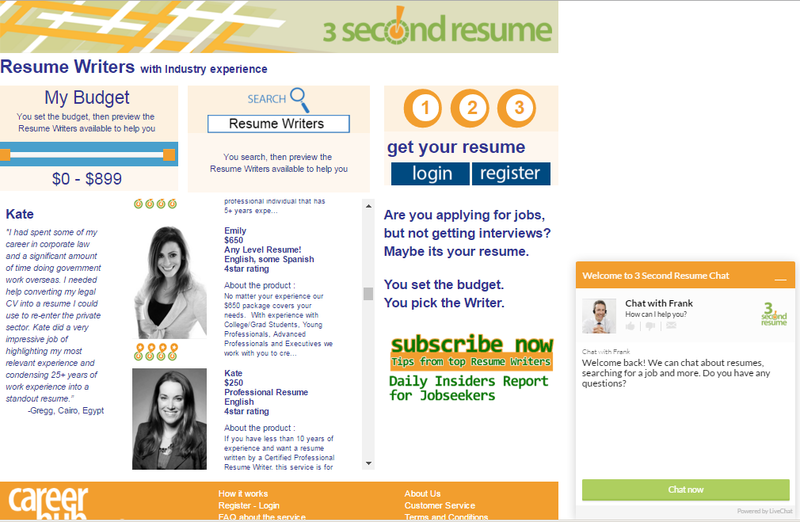 The system presents Resume Writers with matching industry and language experience, all within the buyer’s budget. We take a small fee upfront from the resume buyer. You collect the balance of the fees. There are no upfront fees from the Resume Writer. To offer a satisfaction guarantee, and to deliver an excellent product, we use an achievement and results-driven style resume. The resume must include numeric results to showcase a Jobseeker’s achievements. Secondly, the resume must not include meaningless soft language such as… “team player”. More on this later. Have a look at the website & give me a call for a chat! and…. Why is it called “3 Second Resume”? It only takes the Reader 3 seconds to figure out the Jobseeker!